At present, if migrants represented the population of a country, they would constitute the fifth most populous country in the world. By 2010, the number of migrants has risen to 214 million from 150 million in 2000. Migration is now widely distributed across countries, more so than in 2000 when migration tended to be directed to the top ten countries. In this globalised world people of all classes are forced, or choose, to lead a nomadic lifestyle. Among them is Vero SchC<rr, who in the past 12 years of her life has lived in seven cities in four countries. Her experiences led to questions and to the search for an alternative definition of 'home' that reflects its transience. 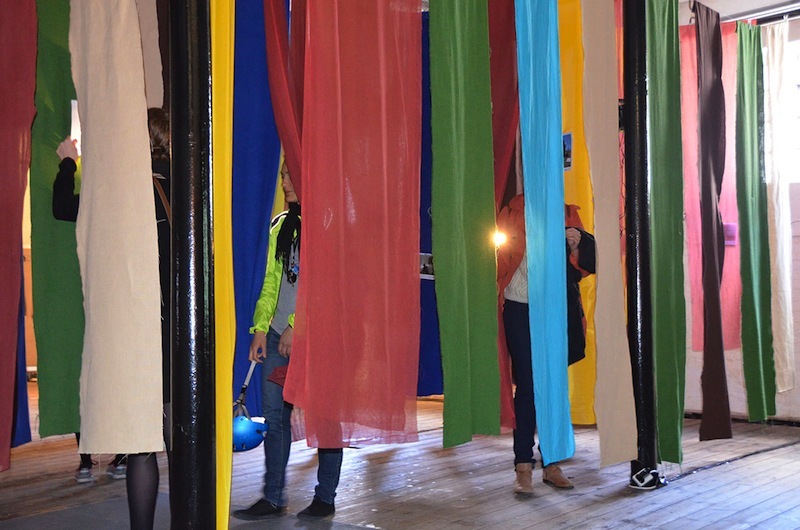 This is how the multidisciplinary project, 'Transient Spaces b what is home?' began. Transient spaces b what is home? The project uses a narrative based design process to explore whether home can be redefined and if home and transience can co-exist, as seems to be required in a continuously globalised world where people of all classes are required or motivated to lead a nomadic lifestyle. The narrative approach adopted by the project is a way of defining a concept that is changing and multiple. This paper will show how the project made use of this approach to reflect the process of 'home-making' and to discuss 'home' outside the habitual discourse of migration. The narrative approach enabled engagement with a topic that goes beyond the surface and requires us to take a second look. Another way of envisioning bhomeb is to see it as the footprint of our inner self. With this in mind, the paper will also look at how a narrative environment can trigger, or even mimic, the internal process whereby individuals constitute home. Can the content and the installation encourage thinking about our own notion of home and contribute to an understanding of the consequences? 'Home' has been a topic of study in numerous disciplines. Shelley Malletbs article, which traces the relevant theories and empirical literature on the subject, asks whether a home is a place, space, feeling, practices or an active state of being in the world highlighting how much bhomeb is a multidimensional and, sometimes, contradictory concept. 'Transient Spaces- what is home?' uses Tony Frybs bHomelessness: A Philosophical Architectureb as a main pillar of theoretical framework. He said: bTo be homeless is more than just being without shelter. It is to be without a crucial point of reference from which oneself and the world is comprehended.b The increased migration and the possibilities or obligations to temporarily live elsewhere mean, to a certain extent, a return to a time when the term bhomeb was defined by being part of the world and not by possessions. Human bsettlement marked a fundamental shift from our being world dwellers, who owned nothing and everything, to our becoming dwellers in a place to which the claim of belonging was made. In a real sense, belonging made the accumulation of belongings possibleb3. The concept of home has thus become a driver for a constantly growing volume of unsustainable consumption, regarding the world as a 'standing reserve'. This could indicate a paradigm shift. Home, and therefore also homelessness, should be redefined and subsequently our understanding of patriotism. The project also takes inspiration from phenomenology, as defined by Husserl. He posits that phenomenology concentrates on the study of objects of direct experience and items or issues that represent the intuitive nature rather than rational knowledge. In the context of 'Transient Spaces b what is home?' the house and belongings are seen as manifestations of a sense of home. The project explores how dwelling space and objects are used and re-defined. These concepts are complemented by Jungbs theories about structures of personality and the collective unconscious, Csikszentmihalyibs analysis of the meaning of things and Bachelardbs poetics of space. ...home is a point of reference from which onebs self and the world can be comprehended. ...home is the footprint of our inner self. The development of the spatial design is based on a poetic translation of theory and research findings into a narrative environment that allows the visitor to experience the diversity of 'sense of home'. The focus is on the experience of being lost and serendipity (see bNo reference pointb below) and an emphasis on a sensory approach that adds smell, touch, sound and taste to the visual experience. The aim is to liberate from categorization, displaying the fact that there are as many bhomesb as there are people. The exhibition was built on a long process that emphasised new research methods and their possible output. The very user-centred approach and the focus on people, their reasons and backgrounds do not provide immediate data results but require a qualitative rather than quantitative research method. 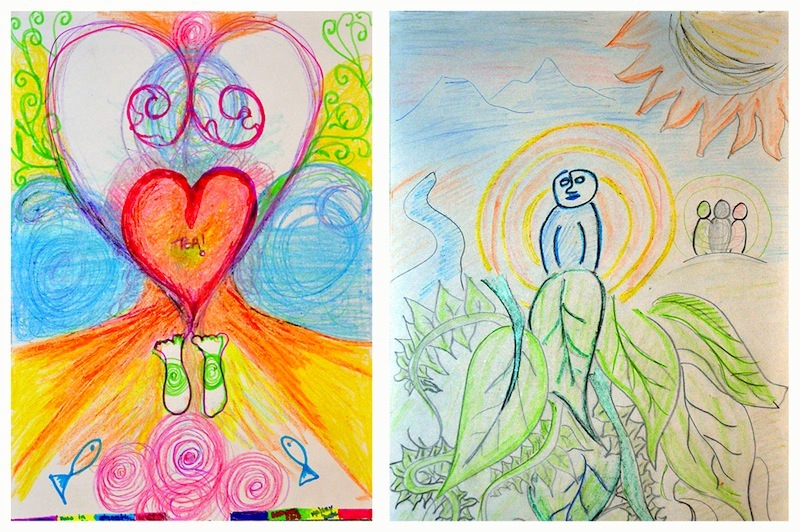 SchC<rr decided, therefore, to understand and implement the use of Art Therapy using qualified practitioners. These methods allow an in-depth insight without intimidating the participants. The workshops and direct contact were mostly visually guided and accompanied by a loose interview or friendly talk. Complementing the more qualitative research, is a carefully designed survey that functioned as a control group. It worked in two ways, on one hand it encouraged the participants to think about their notion of home and on the other hand it provided data to complement the other research. "A narrative environment is a space, whether physical or virtual, in which stories can unfold. A virtual narrative environment might be the narrative framework in which game play can proceed. A physical narrative environment might be an exhibition area within a museum, or a foyer of a retail space, or the public spaces around a building b anywhere in short where stories can be told in space." "Narrative is 'that which tells' and environment is 'that which surrounds'. Following Ricoeur (1984), it might be said that narrative orients us in time; while environment orients us in space. Further, narratives are both the telling (plot or emplotment, the sequence of events as told, narrative discourse) and the tale itself (story or narrative structure, with beginning, middle and end); environments both surround (actively environ, enclose and condition) and are the surroundings (environmental structures, categories and entities)." All elements of this participatory project (see diagram 1 below) encourage an exchange of sense of home. It is aimed towards adults that have more than one 'home', the audience are people that have challenged their sense of home and want to exchange and reflect on it. 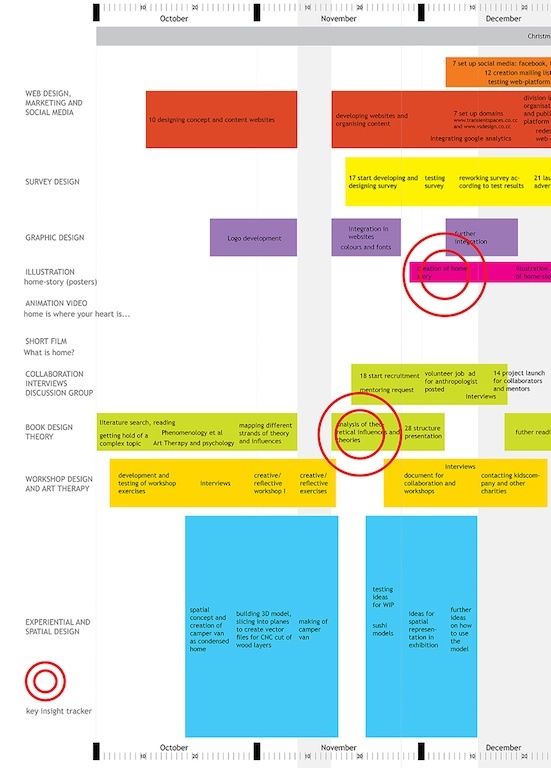 Through the diversity of these elements each participant or visitor can find his or her way of connecting with the project's question. The following section will outline how the project "Transient Spaces - what is home?" reflects the complexity of defining home and multiplicity of existing definitions. A global nomad in this sense is defined as a person who has experienced different cultures from an in-depth point of view, having lived in at least two countries with the idea that this place is or will become 'home'. In order to create engagement and an appropriate interpretive strategy, it is crucial to know your audience. Since the target audience of this project is represented by an inner state of mind rather than a particular demographic, research had to go beyond preconceptions and the narrative has to work on different levels, providing a possible access point for each participant. 1.) Firstly with their own notion of home: the research that was conducted throughout the project showed that people's first association of bhomeb b mostly a rational concept that is determined by their cultural conditioning b does not necessarily correspond to what makes them feel at home. Therefore I had to develop ways to reach beyond these preconceptions and to address a more unconscious level of emotions, memories and ideals. 2.) Secondly with each other: most elements of the project were designed to trigger a discussion, to make people think and discuss their ideas with their friends and family. 3.) Thirdly with the project: the above elements also ensured that there is the option for participants to feed back to the project and to exchange their experience with others. Engagement was created by leaving space for the audiencebs own identification while gently guiding them towards their own thinking process. 4.) Additionally marketing and social media strategies encouraged new participants and raised awareness of the project's questions. The "Transient spaces - what is home?" pop-up exhibition took place in a closed-down warehouse in London. Firstly, through the installation the space was transformed into an exhibition. Secondly, the narrative environment design involved the visitor in a personal experience to discover the diversity of 'sense of home' while making the visitor feel 'at home' in the exhibition and encouraging personal involvement. Since the place of action is the inner self and is therefore an intangible space, research, analysis and all resulting work has to be conducted in a different way than when examining a tangible space. There is a strong correlation with psychological methods (as explained in 'Taking the psychoanalytical position and in note). However, the result is a tangible outcome and provides a sensory experience. This antagonism between the tangible and intangible raises issues that require an adapted solution. Home is a crucial point of reference from which onebs self and the world is comprehended (inspired by Fry). If home is a reference point, homelessness is missing a reference point. Taking this reference point away enables one to open up to explore new answers. This effect of being lost was created by the use of hanging curtain-like fabric. The quantity and density of the fabric obstructs the visitorbs vision and takes the reference point away. Through stories of others, visitors are inspired to reflect on their own sense of home. Each personal story of home is printed upside down on the back of the corresponding picture. Pinned onto the fabric, visitors have to lift the picture to discover the story. Torches, that the visitors are given at the entrance are the only direct source of light. The journey to our inner self is never a straight and easy one, never one that can be foreseen. Hence the elements of discovery in the design of the installation. The torches as light source reinforce this idea of serendipity and exploration. Hanging fabrics, like curtains, taken out of their usual context represent the threshold from public to private, they prevent insights that we are not willing to allow and close or open up to the surroundings. They represent another kind of border. Fabric produces a sense of homely warmth and gives a personal touch to our homes. Using these elements separated from their usual function, producing a high density environment, they function both physically and metaphorically as an obstruction of sight. By pushing them to the side, by going through them, we discover new visions and encounter other people. We step back and forth, from me to us, from self to other and are sent on a journey of discovery. The design language of the project and the exhibition is deliberately unpolished in order to represent the beginning of each personbs journey and the fact that there cannot be a definite answer to what home is. It is the beginning of a journey of continuous personal growth and of a collection and exchange of stories of home. The colour code of the book and other print as well as the choice of colours for the fabric are based on the survey results. The drawing style of the home-story, the logo and the videos also build on the principle of leaving space for growth. Conclusion b Can there be an answer? As 'home' is a very subjective feeling there is no objective answer to what 'home' is. 'Transient spaces - what is home?' displays notions of home and a juxtaposition of subjective views. These peoplebs subjective views trigger a thought process in the visitor to think about his or her own sense of home. The project managed to trigger and reflect this internal process in participants throughout the project and within the exhibition. A success that is measurable by the feedback of the people. However, it also showed that there is a gap between the thought concept of home and the actual sense of home. The initial thought of what people think their 'home' is does not necessarily correspond to what actually gives them a sense of home. During research and workshop sessions,B many participants surprised themselves about the outcome of their own reflection. The project's research suggests that the concept of 'home' is strongly determined by the vicinity of family and friends. However, this ideally physical vicinity can be replaced by the possibility to easily get in contact with them. The narrative approach played a crucial role in the scenographic design as well as the strategy. It enabled engagement for a topic that goes beyond the surface and requires us to take a second look. Furthermore, by transforming space into place, the narrative design approach mimics the process by which individuals, including the participants transformed a new and unknown environment into a place that they could call home. The project continues to grow through discussions with global citizens. For more information and to take part in the conversation see www.whatishome.net. Sign up for the newsletter or follow the project on Twitter @transientspaces or like it on www.facebook.com/transientspaces. Joanna Cordero was a contributor on the 'Transient Spaces' project. Like Vero, Joanna has multiple homes in cosmopolitan cities, including Manila, Geneva, New York and London. After completing a BA in English and Art History, she acquired an MA in Journalism and an MA in Migration and Diaspora Studies. She is a freelance media practitioner. Fry, Tony. 2005, Homelessness: A Philosophical Architecture. Design philosophy papers. 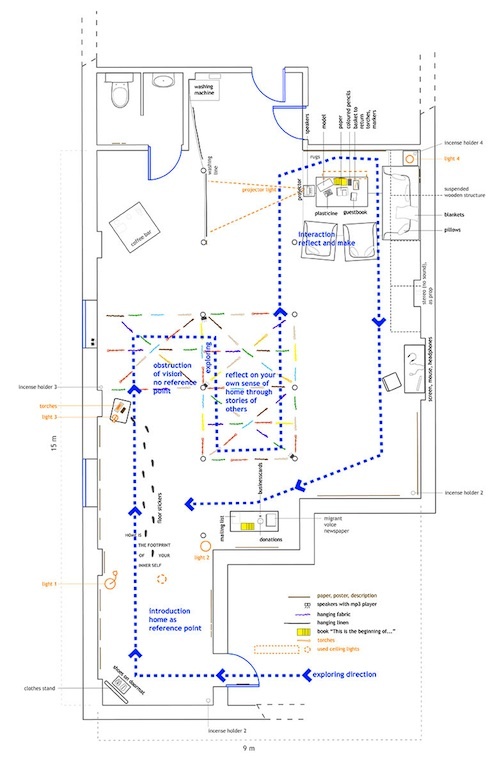 See: http://en.wikipedia.org/wiki/Narrative_environment Last accessed 25.05.2013. Taking the 'psychoanalytical position': Based on the Freudian couch the project takes the position of the listener, giving stage to personal stories of home, providing an 'empty canvas' and a thought-provoking impulse. An important design decision was to ensure that the design keeps respect for the individual stories. In a metaphorical sense it avoided to expose the private too much in spotlight. Alienation in a Narrative Environment: Alienation as a psychological process is crucial so as to absorb and understand emotions and thoughts and being able to internalise them within a longer process. When Brechti refers to alienation (distancing effect) he talks about it in the context of theatre plays that usually took place in a theatre that has a stage that is physically separated from the auditorium and thus puts the audience in the position of the invisibleii spectator. This position has been multiply discussed in literature about the performing arts and drama. Yet, in a narrative environment the visitor is immersed into the space of action, he might even become part of the narrative and therefore cannot maintain a position of alienation in Brechtbs sense. Therefore alienation is referred to as a psychological process that maintains a critical position. i Bertold Brecht (2000). Schriften zum Theater, Bd. 41. Berlin: Suhrkamp. ii Invisible because the actors act as if there was no audience.